Big Red Horse Productions is offering commissions for the first time in re-positioning, re-sculpting and finishing. I’m offering at this time slots only for re-positioning and re-sculpting with painting of the customized model by me if the customer so wishes. I work primarily with smaller scales, stablemates/chips and classics, but will take on traditionals as well. 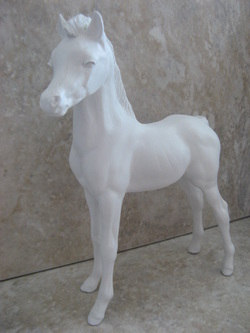 I can do as little as just re-sculpting manes and tails to doing drastic customs. I try my best to make my prices affordable for all. Trades for my work are acceptable and want lists are posted here on MH$P. Time payments can be worked out beforehand if the customer so chooses. While I would love to paint every model I customize I know some customers would prefer to have someone else paint them and I’m okay with that as long as no changes are made to the position/sculpting work I did on the model. I offer free repairs to any model I customize, all the customer has to do is pay for shipping to me and back to them. As far as turn around times I try to take my time on each and every piece to make it the best it can be while still not keeping the model from his/her home for too long. I use Aves Apoxie Sculpt for customizing and will meticulously prep each model before painting or sending back to the owner. Ears will be carved correctly and upturned hooves as well. Pictures will be sent to the customer to make sure the model is what the customer wanted before sending back to the customer. I use Rustoleum’s Painter’s Touch primer to primer every model and give it a silky smooth finish before painting. For painting I use a combination of pastels, acrylics, and pencils and seal with multiple layers Dull Cote. Payment for models must be by Paypal or MO, with Paypal being much preferred. Payment must be sent to me by, at the latest, a week after the model has been completed. If a body is not provided by the customer I can find one for you for the body’s purchase price plus a small fee. I will not recreate another artist’s work or alter any other artist’s work without their written consent. I will do portrait models but please allow for some artistic freedom, this includes non-portrait models as well. The prices listed below can vary slightly with the condition/type of body used in the customizing (Exam: Resin vs Plastic or a very rough body vs a smoother one.). For example a traditional foal will cost less than a traditional adult horse and a very rough old breyer will cost more for prepping than a very smooth resin. Contact me privately for a quote if you are unsure. Painting prices can be determined when and if the customer chooses to have me paint the customized model. I’m not offering strictly painting to the public yet, only to models I have customized. I will also repair damaged models as well. Just email me for a quote. Here are some examples of my finished work. More can be seen in my gallery. I thank you for your interest in my work and I hope to hear from you soon! If you have any questions please feel free to ask.